So the Insurance Company Denied Your Claim? ● The insurance company adjuster could have used the wrong information. ● There may be a misunderstanding between you, and the insurance company. ● The evidence for the claim was cast-off in some way, unintentionally. ● The wrong information may have been written down by the insurance company adjuster. An insurance adjuster comes to visit and assess your Florida home’s property damage. The insurance adjuster works for the company you are insured with. He is on their side, not yours. This is the way a lot of homeowners insurance companies will do their business. Many times, these insurances companies will try to pay you, the policy holder, the smallest amount possible for the type coverage you paid for. Have you studied your policy, and do you know your rights, in the policy? You may be able to appeal the denied coverage decision. You could also ask for a second inspection. Look back at all of the item’s documentation. Make sure that you have taken all the steps necessary to protect your home or business. A public adjuster ( like those of us here at Southeast Public Adjusters ) who is hired early enough during the claims process may have the opportunity to help you to receive a fair settlement for your losses that are covered under the policy. Even after you receive a settlement, a public adjuster could work for your benefit to get a higher amount for your losses. 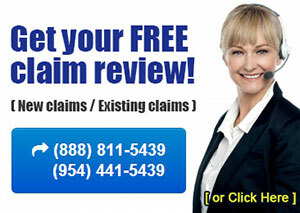 Southeast Public Adjusters are a leading source on Florida insurance claim reviews. Southeast Public Adjusters has been helping both homeowners and business owners throughout Florida review their underpaid claims and denied claims for years. If you have suffered recent losses, and experiencing trouble collecting on you insurance, we are here to help. That’s all we do. Southeast Public Adjusters can answer your questions, and even offer a free property damage claim review. Give us call at (720) 626-2505 or click here to contact us. Yes, I need help with my insurance claim!